I'm trying to figure out what is the best approach to start with an Extension Board to add dual extruder to Gen7. I think there are several choices, like a) using SevenSwitch as heater and to implement stepper socket and themp sensor in the extension board; b) implement all heater, stepper and themp sensor in the same board, or c) add themp sensor to SevenSwitch and using extension board only for the stepper driver. I supose there are pins for all of this, but both the stepper and heater need 12V, right? Following the Gen7 Board design, those could be the HDD free connector in each wire. So needs the second approach 2 HDD connectors in the extension board, or is it safe to use the same 12V line to feed the extruder heater and the motor? I think not. I supose there are pins for all of this, but both the stepper and heater need 12V, right? Yes, when putting a heater or a stepper driver (or both) onto an extension board you need an disk power connector there, too. A single one is sufficient as long as you run both with the same voltage. Gen7 main board has two to allow more juice for the heated bed. 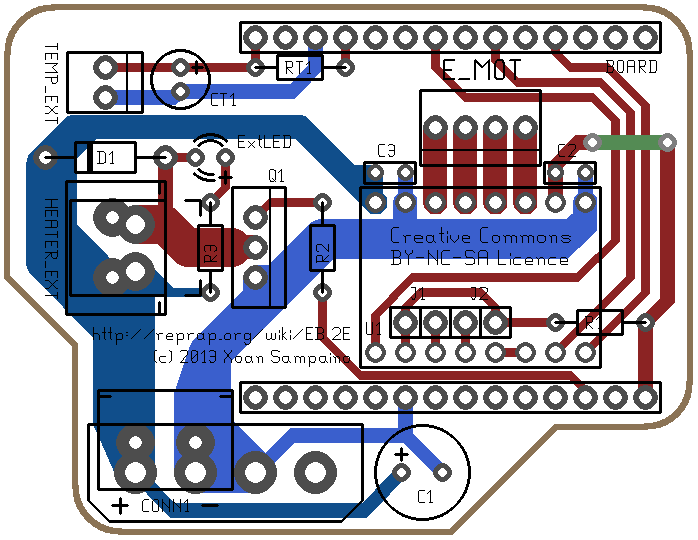 Schematic and PCB files are also in the Gen7Board-AVR-S branch of my Gen7 fork. Edited. I forgot the most important point: I don't have any electronics knowledge, so all the above may be wrong at all. Any kind of feedback would be --as always-- very appreciated. Edited 2 time(s). Last edit at 03/21/2013 06:08AM by xoan. Looks nice! Is there sufficient place to mount a heatsink onto your mosfet? I'm using a seperate PCB connected with flat cables through some kind of adapter plate which is connected to the expension header. I'm reusing the original DIR Pin of Extruder0 on Extruder1 so I only need one additional Pin (STEP) to drive the second Extruder. Is there sufficient place to mount a heatsink onto your mosfet? Depends on the mosfet heatsink type and the way you mount it, but the point is that in the extruder mosfet there is no need of heatsink as well as in the heatbed. IRLB8743 is nice. Edited 1 time(s). Last edit at 03/20/2013 03:41PM by xoan. Absolutely right . It was a quick and dirty proof of concept. That's why I haven't made it public. > well as in the heatbed. IRLB8743 is nice. Looks good! I guess the motor header is a bit too close to to the Pololu (you need space to allow the friction ramp to work), but that's easily solvable. I've put a link into Gen7's wiki page. Also switched to 6 pin IDCs for all cables from the expansion to the panel. > Gen7Board-AVR-S branch of my Gen7 fork. > may be wrong at all. I've made a check and there is enough separation between them, but any way, it's now like in the Gen7 board. So while I wait for pololus, anyone test this yet? I was just looking over your design and it looks great! It looks like something I may want to try after I get my RepStrap built and running. Looking closer at your design, I noticed that you do not have your ground connected to the ground on the Gen7 mainboard. This may not be a problem if the power supply shares a common ground. But to make sure, you should probably connect the ground from the negative side of C1 to pin 6 on the mainboard's connector CONN4. In fact, I don't know why I didn't ask this issue in my first message, 'cause it was one of my doubts about GND paths: temp circuit is connected to AGND, and in the schematics  I had to make this as a separate GND (AGND:1) to avoid errors, and do not expose the GND pin in the ExtensionBoard. I don't know if this is also the right way to do it, but I'll fix it with your advice. Actually not tested in real dual extrusion (now I need a second extruder , but configured and used as the primary extruder. It just works, as expected. I'll put some information in the wiki this weekend. It would be nice to add these photos to the wiki, too. It wasn't clear to me how this was going to mount. In fact, it's still not entirely clear. :-) But I see that I guessed correctly that it is a piggy-back mount over the AVR chip. Do you have any posts to hold it steady or do you solder the header in place on the AVR? Did you consider moving the AVR onto the daughterboard and then running headers into the IC socket, or is that too crazy an idea? It mounts in the same way that the other extension boards do. I've made some changes in the schematics and pcb layout to add some of the SevenSwitch  and Gen7 Board  modifications. Also added a header with SIG-12V-GND output to connect a fan using a SevenSwitch or similar in order to run an active cooling fan. Edited 1 time(s). Last edit at 03/06/2014 01:59PM by xoan. Dumb question (but I couldn't find the info elsewhere and my electronic knowledge is kinda limited), could this extension board run on 16Mhz electronics (ramps)? This extension is designed as a shield for Gen7 (look at the pin headers labeled as «BOARD»), so if you want to use with other electronics board, you may want to make an interface to conect this pins (maybe a breadboard or something similar).